Dr. Evlyn Romanowski was born in Edmonton, Alberta. She attended the University of Alberta and the University of British Columbia, where she graduated with a D.D.S. in 1993. Dr. Romanowski has continued her education in esthetic dentistry and orthodontics. She is an active member of the Canadian and Alberta Dental Associations, the Academy of General Dentistry, and the Edmonton and District Dental Society. Evlyn continues to strive to provide the highest quality of care to her family of clients with dental technology and continuing education in a warm, caring, and gentle environment. Dr. Kris Kalhs was born in Drumhallor, Alberta. He attended the University of Alberta, where he graduated with a D.D.S. in 1977. After graduating from dentistry, he spent a year in the University Hospital internship program where his primary focus was on surgery. He won an award for orthodontics while in university and has continued with this passion for more than 20 years now. Kris is an active member of the Canadian Dental Association, the Alberta Dental Association, the American College of Oral Implantology, the Academy of Osteointegration, and has a fellowship in the International Congress of Oral Implantologists. Equipped with experience, technology, and education; Dr. Kalhs is able to provide cosmetic enhancements, implants, oral surgery, sedation in conjunction with these procedures, and general dentistry. 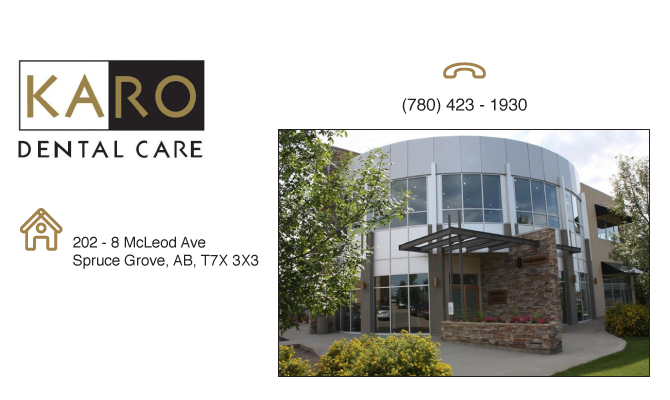 He enjoys providing quality care in a client focused, friendly, and comfortable environment. Dr. Catheryn Shea graduated from Camrose Composite High School in 2003 and went on to receive her undergraduate degree in biological sciences from the University of Alberta. She continued her studies at the University of Alberta and completed the Doctor of Dental Surgery program in 2011. Dr. Shea enjoys all aspects of general dentistry and prides herself on quality care. Her gentle and caring nature are what attracts patients to her. Dr. Shea loves traveling and enjoys hiking, tennis, skiing, and yoga. She is very excited about her position at Karo Dental and looks forward to serving Spruce Grove and the surrounding communities.